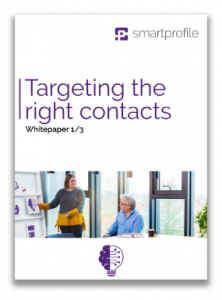 In this whitepaper we help you take the first step towards realising your maximum potential based on business-to-business direct marketing. To enable the whole process to run as smoothly as possible, you first need to have a complete and correct picture of your target audience. You will then be able to gather the right insights for taking action, which will be dealt with in more detail in our whitepaper on Successfully using actionable insights. Finally, based on having the right contacts and gaining relevant insights, you will use campaigns to increase your turnover efficiently and measurably. This is explained in further detail in our whitepaper: Take action; realize potential.